The long-awaited first girl group of Woollim Entertainment has finally debuted with an actual group name! Rumours about Woollim Girls have been circulating for some time among fans, especially with the very teasing tweet in October from Woollim, so perhaps it is high time for the company to finally reveal this hidden treasure. The new group with the name of Lovelyz will consist of 8 members and is expected to have their first album release on November 17. Yoon-sang, the producer well-known for his songs’ quality, will be the main composers for the album. Woollim has prepared for its first idol girl group quite meticulously, as several members have already been introduced to public with positive response. Baby Soul has already been a solo singer for some time with a few music videos of her own as well as featuring in subunit Infinite H‘s album. She has an impressive voice and unique music style, as seen from the sensational music video starring Yoo Jia which implicated a lesbian love theme, “She is a flirt.” It will no doubt make Baby Soul one of the main vocals in Lovelyz. Yoo Jiae is also a familiar face as Infinite‘s fans all know (and love) her through the group’s very first variety show “You are my Oppa” in 2010. Woollim has also let her debut last year April with the music video “Delight”. Last but not least, member Jin had “Gone” and played the main female character in Infinite’s “Last Romeo” music video. To say the least, the girls have summoned a certain amount of experience through these well-planned exposures. It remains a question whether Lovelyz will be just a female version of Infinite. We are not sure about their dancing ability yet, as what snippets Woollim has released so far were more inclined to showcasing the girls’ singing competence. 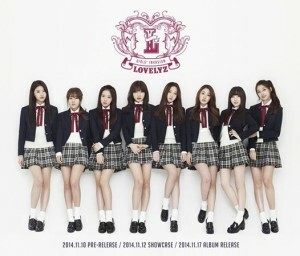 Lovelyz perhaps will go with a cute and sweet style similar to A Pink, if the group name is anything to go by. We will see how these newbies do in a K-pop era with way too many boy bands and girl groups to remember, but one thing for sure is that with Woollim’s diligent promotion efforts over the last few years, Lovelyz has already receive quite an amount of support and expectations.